Adult cicadas, and the shed skins of cicada nymphs. Oh, you’ve put in your time. You’ve spent years working the underground scene. You’ve been building a name for yourself. Digging away, making progress. There were creative phases, and then you’d plateau… only to break from your shell, bigger each time! Sure, there have always been critics—predators, really— who would try to stop you. But now is the time to burst out into the light, to spread your wings, to… to… to sing! Wonderful! You could do this for the rest of your life! 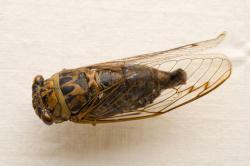 And, as a cicada, that should be about three more weeks.